The 1958 Stanley Cup Final NHL championship series was contested by the defending champion Montreal Canadiens and the Boston Bruins in a rematch of the 1957 Final. 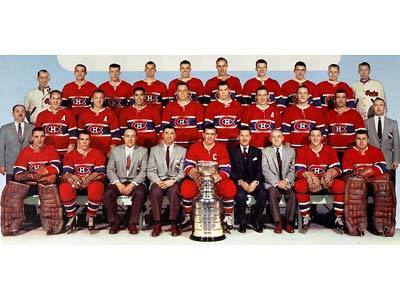 The Canadiens would win the series 4–2, for their third straight Cup victory, and tenth in the team's history. Montreal defeated the Detroit Red Wings 4–0 to reach the final. Boston defeated the New York Rangers 4–2 to reach the final. Rocket Richard, was the top goal scorer during the playoffs with 11. In game five, he notched his third final series overtime goal of his career and sixth playoff overtime goal of his career. For a second consecutive year, the Montreal Canadiens met the Boston Bruins in the Stanley Cup final. Boston was coming off a high scoring series in which they defeated the New York Rangers, outscoring them 28 to 16. Maurice Richard led the playoffs in scoring with 11 goals. It took Montreal six games to defeat the Bruins, completing the series win with a 5-3 victory at the Boston Garden. This third straight Stanley Cup win equalled the previous record set by Toronto, who won Stanley Cups in 1947, 1948 and 1949. Beginning the playoffs with a healthy squad firing on all cylinders, Montreal’s first opponents are the third-place Red Wings. A crushing 8-1 defeat in the opening game sets the tone for the series. It takes four games to send Detroit packing for the summer, with the Canadiens outscoring their opponents 19-6 along the way. The team now enjoys a week off while fourth-place Boston deals with the Rangers, whose second-place regular season finish had come as a surprise to most observers. Riding a 14-goal outburst in the two final games against New York, the Bruins dropped the first game, losing 2-1 before Forum fans. The second game went the visitors’ way 5-3, sending the series to Boston, where the Richard brothers provide the scoring punch, combining for all three Montreal markers, as a flawless Jacques Plante blanks the Bruins in the third match. The teams continue to trade victories as Boston rebounds to take the fourth game 3-1, tying things up for a second time. Game 5, tied at two goals each, goes into overtime and the game is sealed by Maurice Richard, his winning goal coming almost six minutes into the extra frame. Montreal fans head home just one victory short of celebrating their third straight Stanley Cup Championship. Bernard Geoffrion’s deciding goal in the 5-3 win leads the Montreal Canadiens to victory, becoming the first team to capture three consecutive Stanley Cups since the 1948-49 Maple Leafs.